YOUNG people trying to find affordable accommodation in Hackney may be dismayed to learn that a new price record is being set. A house facing Victoria Park has gone on sale for £6 million. The former church hall at the corner at the corner of Homer and Victoria Park roads, London E9 5DX, is a house with more bathrooms than most homes have bedrooms: six. Oh, and a shower room. The building was a Lithuanian church hall when a developer bought it for conversion to luxury flats. But the developer’s wife decided she wanted to make it the family home, and spent thousands on creating six bedrooms with en-suite bathrooms and on the ground floor a living – sorry, drawing — room with a kitchen, a cinema/gymnasium and a study. Decorating meant lots of marble finishes and the importation of an artist from Poland for mural painting. 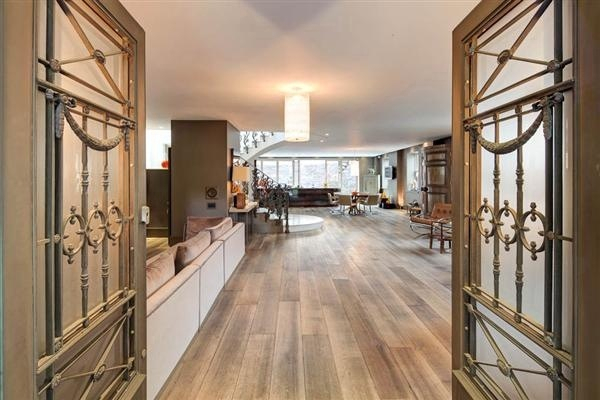 The estate agent FJ Lord describes the decor as “contemporary, with a bespoke finish”. One can but admire the agent’s neat sidestepping of the taste issue.